Brett Taylor has been doing just fine living in his little world of grief and pain for the past three years—thank you very much. Losing someone special is life changing, and Brett doesn't understand why everyone and their damn dog thinks they can get all up in his business about moving on. He's accepted his job going from musician to rancher without relying on anyone else's opinion, and he doesn't need some city kid coming into his life to break the habits he's been practicing—grief, isolation, and a whole lot of Jack Daniels. JT Campbell was on a quest to escape his old life, and to figure out who he is and where he belonged as he moved from one meaningless job to the next. He wasn't looking to save anyone, let alone a secretive, hotter-than-hell rancher who wore his heart on his sleeve. He likes working for Brett, but it's been made perfectly clear that any relationship other than professional will never see the light of day. But when JT's lust turns to love, and he gives in to his desire to find out what makes Brett tick, will his patience and support result in Brett lowering the walls he's built-up enough so JT can unbreak his heart? 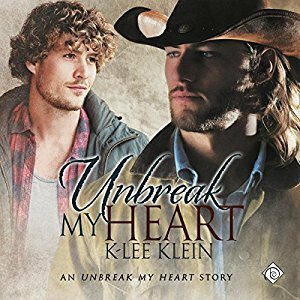 While K-lee Klein's not exactly a new to me author 'Unbreak My Heart' is the first novel that I've read and really I'm just wondering...what the hell was I thinking taking so long to enjoy one of her novels...ok, I admit it was once again a case of so many books, so little time and thank heavens for audio books and Nick J. Russo because once again he's done a superb job with narrating this audio book resulting in the fact that I'm actually kind of glad that I didn't get to this book sooner...nah, that's not true because I'm sure I would have totally enjoyed reading this and still would have made grabby hands for the audio book. But all that's neither here nor there because what's done is done and I totally and thoroughly enjoyed the audio book. I love stories about damaged men putting themselves back together and grabbing the second chance that life has given them and if at least one of those men happens to be a cowboy well...happy me and ironically while I'm not a huge fan of stories with rock stars in them for some reason country and western singers totally do it for me which is hilarious because I'm really not a big fan of the music...go figure we like what we like. My only niggle with this story was the use of the endearment Darlin', it was used by Brett both in his letters to his deceased lover Walter and with JT and I have to admit I would really have preferred if Brett had used another endearment for JT...even the dreaded Babe...maybe. However, while this was as I said a bit of a niggle overall it didn't really spoil how much I enjoyed this story. JT Campbell is looking to get away from his life and ends up at Brett Taylor's farm when Brett's mom picks him up at the side of the road. Brett's mom to say the least is a character. Despite his reluctance Brett gives JT a place to stay and a job. Brett and JT have a few things in common not the least of which both men are looking to escape their past. JT's doing it by leaving his home in California and Brett's choice of escape lies in the bottom of a bottle that he keeps in his office where he hides out most evenings. Brett's days as a country music star ended when he lost the love of his life three years ago and he's spent the time since swirling in the pain and grief brought on by that loss and he's more than willing to let life go on in this mode. I totally appreciated the fact that 'Unbreak My Heart' isn't a 'love-at-first-sight-story'. Brett and JT start out essentially as two men who are brought together by circumstances and initially Brett's really not in a place for any kind of relationship. It takes time and effort on JT's part for Brett to even really consider a relationship as a possibility and while JT's patient, he's not perfect making a few mistakes of his own as things progress between the two men. Much of Brett's story is shared with us through his letters to Walter, letters that were both touching and heartbreaking and along with his time spent getting to know JT a sweet slow building romance is created...one that was made even more enjoyable through Nick J. Russo's skilled narration of the audio book. While there was a definite age gap here of 13 years once again it wasn't an issue for me. JT was 28 to Brett's 41. I liked both of these characters and the fact that while JT was in some ways in a better place in his life he wasn't perfect, but he did have a maturity that helped him to realize that more than anything Brett needed him as a patient friend...a friend who was willing to wait for Brett's own feelings to catch up with JT's growing feelings. I loved the ending of this book or maybe I should say the beginning of Brett and JT's life together. I'm looking forward to more of their story as I continue with this series my only quandry is do I want to read the e-books or hopefully wait for the remainder of the series to be released on audio...decisions, decisions...really whatever is a girl to do? An audio book of 'Unbreak My Heart' was graciously provided by the publisher in exchange for an honest review.